1358 lbs. (615 kg) with ATV tires; 1369 lbs. (620 kg) with HDWS tires. Use the cargo bed to haul up to 441lbs of dirt, gravel, rocks, hay or whatever will fit. The bed also manually tilts up to make dumping or unloading cargo easy. Features ergonomic, well-placed controls for easy operation and a comfortable seat so both the driver and passenger can enjoy a day of work or play without fatigue. A low operator platform offers ample and obstacle-free legroom making it simple to step on or off. 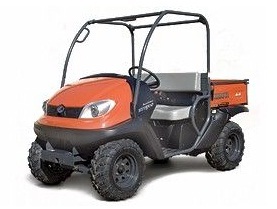 Kubota specially design the compact frame of the RV500 to make it easy to load onto a full-size, long-bed pickup truck or trailer so it can be taken wherever you go, making it ideal for camping, hunting or any other rugged outdoor adventure. This exclusive and innovative hydrostatic transmission eliminates the need to adjust belt drives and provides the RTV500 with an exceptional level of performance, handling and reliability under tough conditions. It also provides excellent engine-assisted hill descent control. The 15.8 hp, 2-cylinder gasoline engine is liquid-cooled to ensure reliability and minimize noise and vibration. This reduces operator fatique and increases efficiency. This engine features an Electronic Fuel Injection (EFI) system that provides on-demand power, optimizes acceleration and enhances quiet operability. The EFI also eliminated the need to adjust the carburetor and enables better engine start-up in cold weather while improving engine serviceability. Robust, Reliable, Semi-independent Rear Suspension.